Here is a photo of the yummy French Dip for the Slow Cooker from October 2007. 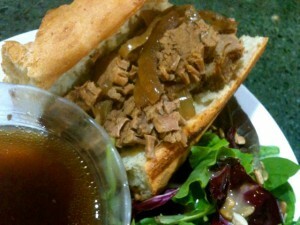 I have two different French dip recipes on the site, but this is the one I make the most often. We really enjoy serving this with a salad and Roasted Rosemary Potatoes made with regular potatoes, sweet potatoes or a mix. The French Bread recipe you can find here.